1967 Triumph TR4-A IRS - This is an unbelievably beautiful TR4. The car has undergone an extensive restoration. What can I say? Based on the pictures, this is the nicest TR4 I've seen in a very, very long time. Located in Akron, OH, Click here to see the eBay listing for this car. 1997 Aston Martin DB7 - Looking for a convertible? Have $40,000.00 to spend? For that money you could buy a brand new Saab 9-3, an Audi TT, a Volvo C70 or a Nissan 350Z. All nice cars. Me? I'd take this low mileage, used Aston Martin. Yes, parts are expensive and there's a pretty good chance there's no dealer in your town, but the extra money and time you'll spend will be all worthwhile when you're driving down the road in this fast, incredibly beautiful car. In my eyes this car is right up there on the list of timeless designs from Great Britain. Located in Kingston, PA, find the AutoTrader.com listing for this 1997 Aston Martin here. 1978 BMW 630CS - This is an interesting gray market car. It has the 3.0 liter six, but it's carbureted (I assume with dual Solexes, but the seller doesn't say) . The transmission is a 4 speed manual, and the car has no A/C and no power windows. First of all it's a pretty unique car. Personally, I'd probably go for a US spec 6 Series. I like things like fuel injection and air conditioning. The European cars looked much better with the smaller bumpers, but you can convert US spec cars over to the Euro bumpers without too much of a problem. But, if you like the idea of having a true European BMW 6 Series, this is probably as close as you can get in the US. Click here to find the Vintage Car Store website. Click on "Foreign Inventory" to see this 1978 BMW 630CS. 1989 Saab 900 SPG - To many US Saab fanatics, the 900 SPG is the holy grail of later Saabs. Less than 8000 made their way to the US between 1985-1991. The SPG had the Saab turbo engine which was capable of moving the car to 60 MPH in around 7 seconds. It also had the SPG appearance and suspension package and virtually every option available for a Saab. This seller of this 73,000 mile Saab (a Saab dealer in Acton, MA) says this SPG was a "trade-in in 2001 for a new Saab." They have had it in climate controlled storage ever since. The seller goes on to state, "It looks, feels, and smells like when it was new. This car shows no signs of paintwork of any kind. All factory, no aftermarket add ons or modifications. Original owners manual present, along with rubber mats, & Saab car cover. Non-smoker previous/current owner, clean Carfax report. The headliner is sagging in the rear. No dash cracks." 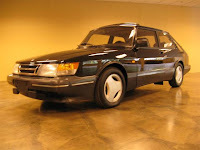 Click here to see the eBay listing for this 1989 Saab 900 SPG. Those early 6-cyl DB7s aren't nearly as engaging to drive as the V12 cars, and the sound of a V12 Aston is one of the greatest accomplishments of the brand in the last 10 years. It's a tempting price for an exotic, but it's unfortunately not really as exotic as it looks in photos. The fit and finish is also poor, as is the mechanical and electrical reliability. The car's built on the old XJS platform (a car which I love and have had 2 of in the last few years) but with the shoddy XK8 electronics that WILL fail one-by-one, leaving you with the windows down in a rainstorm or without a working gauge cluster... Also the engine and trans are frustratingly-slow. Regarding the 40k asking price - there are cheaper ones out there, so for that price I would hope that the car was fully sorted and very recently serviced by an Aston dealer. It's funny that you should point that car out. I almost didn't include it in the post. That post was one that came more from the heart than the head. The DB7 was one of those cars that when I first saw one (back in 1994 or 1995) actually made me gasp. It was, just behind the E-Type, the most stunning looking British car I had ever seen. It was one of those moments that I still remember where I was, who I was with, exactly what the car looked liked, etc., etc. Sometimes something (or someone, I guess) looks so good I overlook the flaws. That might be one of my flaws! That whole piece was inspired by a phone conversation with a friend who's going out to buy a new Saab convertible this weekend. I was teasing her, saying that since she's extremely successful and lives in L.A., she needed something more impressive than a Saab. I sent her the link to that particular Aston Martin. I realized when writing the post that comparing the cost of owning an Aston Martin with the cost of owning a Saab, Nissan, Volvo or Audi is ridiculous. I've never driven an Aston Martin, so I can't say what either the 12 or the 6 feels like, but I agree about the sound. The price is on the high side, I agree (another reason I almost didn't write about it). Again, I'm just assuming that this 11,000 mile car is in near new condition, so it's worth it. Thanks for the input. I appreciate it. Sometimes the heart rules the head and this may have been the case here.